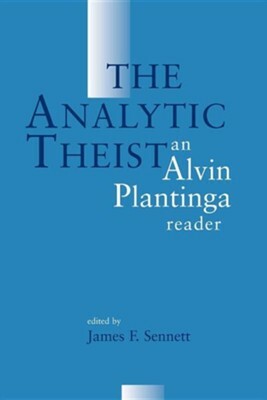 The Analytic Theist is a book of essays written by Alvin Plantinga. The Topic are as follows: Natural Theology and Atheology God and Analogy The Free Will Defense The Ontonlogical Argument Is Naturalism Irrational? Reformed Epistemology Reason and Belief in God ó Justification and Theism A Defense of Religious Exclusivism Divine Nature and Attributes Necessary Being Does God Have a Nature? On Ockham's Way Out Christian Phgilosophy Advise to Christian Philosophers Sheehan's Shenanigans: How Theology Becomes Tomfoolery Christian Philosophy at the End of the Twentieth Century This book is academic, has 369 pages, and is published by Wm. B. Eerdmans Publishing Co. Alvin Plantinga is the John A. O'Brien Professor of Philosophy and director of the Center for Philosophy of Religion, University of Notre Dame. He also has a book called God, Freedom, and Evil. James F. Sennett is assistant professor of philosophy at McNeese State University, Lake Charles, LA and has writen Modality, Probility, and Rationality: A Critical Examination of Alvin Plantinga's Philophy. Alvin Plantinga, called by Time magazine "America's leading orthodox Protestant philosopher of God," has had a profound impact on the philosophical discipline. This book gathers in one place Plantinga's most important work in the philosophy of religion generally and his contribution to the resurgence in Christian philosophy in particular. Organized into four sections-"Natural Theology and Atheology," "Reformed Epistemology," "Divine Nature and Attributes," and "Christian Philosophy"-these thirteen essays and book excerpts reflect the areas of thought in which Plantinga has been most influential. The volume also includes an Afterword by Plantinga and instructions for accessing his work on the World Wide Web. I'm the author/artist and I want to review The Analytic Theist: An Alvin Plantinga Reader.